Play the role British Secret Intelligence Service agent named James Bond in this 3D first-person shooter video game - 007: GoldenEye! This 1997 fps video game is based on the James Bond film GoldenEye and features the same story line and characters as the film. In this game, you play the role of the secret agent as he fights a powerful criminal syndicate while trying to prevent them from using a satellite weapon against London. 007: GoldenEye was is third best-selling Nintendo 64 video game of all time, worldwide. 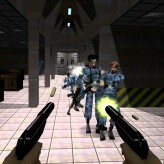 007: GoldenEye is an online N64 game that you can play at Emulator Online. This free Nintendo 64 game is the United States of America region version for the USA. 007: GoldenEye is a single title from the many shooting games, arcade games and action games offered for this console. If you enjoyed playing this, then you can find similar games in the n64 games category. 007: GoldenEye game is from the various retro games on the site, and there are more games like this, including 007: The World Is Not Enough, GoldenEye: 007 and GoldenEye: Rogue Agent.